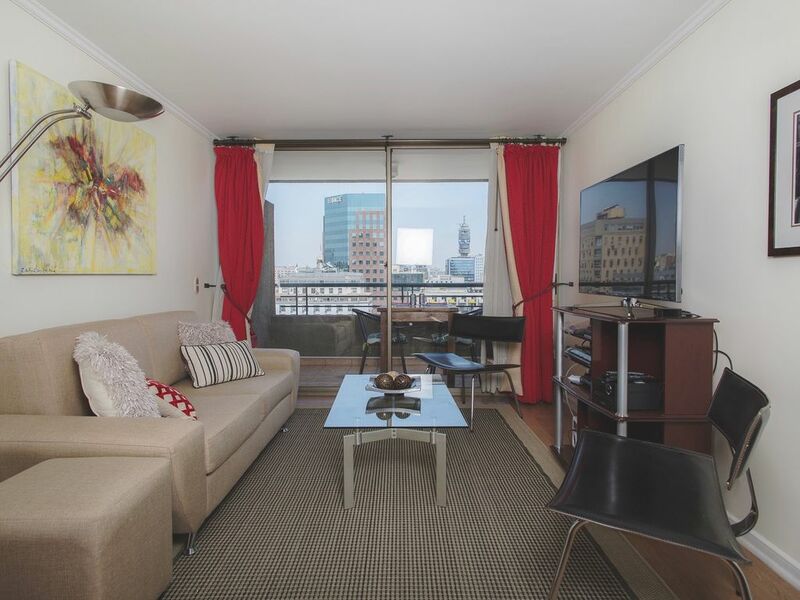 Santiago De Chile Modern Downtown 2BR 2 BA, A/C, W/D, Balcony Views, Location!!! Our 2 bedroom, 2 bath condominium is on the 16th floor of a modern high-rise building with a spacious and secure, wifi-enabled lobby & 24-hour manned security desk. It is located in downtown Santiago, at the intersection of Catedral and Teatinos streets, 3 blocks from two different metro stops (Line 5, green line) and within walking distance of most downtown monuments, Plaza de Armas, La Moneda, the Municipal Cathedral and museums, as well as the famous pedestrian-only shopping street, La Ahumada. It's close to the Universidad de Chile. Nearby Metro stops are SANTA ANA and PLAZA DE ARMAS -- our apartment is between the two. (A map of the extensive Santiago Metro system is found on Wikipedia and In the guidebooks and maps in the apartment.) We are only 1-2 stops (no transfers) from the Bellas Artes Museum and its wonderful collection. On our Metro line (Linea 5) you can travel directly to the Plaza Florida Mall (one of the biggest in the city) and to the Bodega/Winery of Santa Carolina (4th largest in Chile and one of the most historic). Our apartment has maps, brochures, and ideas for making the most of your visit to Chile, including a road map of the country (for you to borrow while you are here). Our kitchen has some staples, such as coffee, salt/pepper, tea, pasta and other non-perishable foods so you don't find an empty pantry before you find the stores. There are mini-markets right downstairs on the corner and two full grocery stores within 3 blocks. There is a nice spa with gym and pool at The Gran Palace Hotel, also about 3 blocks away ($10 per visit, about $115 per month, including towels, locker, sauna). From our 16th floor balcony you have a view of the city and the snow capped Andes mountains. The traditional Chilean-style kitchen has a sit-down bar area and outdoor balcony (called a loggia) with a new (2017) electric LG washer/dryer, washtub, and storage space - its window opens to the exterior for fresh air. There are also community laundry facilities on the 25th floor penthouse level (tokens required, available in the laundry room). American couple (Chile-born husband) owns and manages this well-cared-for Santiago getaway and welcomes mature guests who will treat the property and our neighbors with respect. We love visiting the wineries around Santiago, the endless museums and the great restaurants. Great downtown location, close to the Cathedral, La Moneda, the Bellas Artes museum and the pedestrian zone. Here, you won't need a car because you can walk to the Metro and see what people come to Santiago to see! 24-hour attended front desk, washer/dryer in the apartment, cable TV, high-speed wifi, all maps and guidebooks are provided, spacious closets and modern kitchen and baths. You'll find all the necessary amenities here that other vacation rentals don't include, like extra towels and pillows, basic food items in the pantry, toilet paper and toiletries, CDs, games, and air-conditioning in the master bedroom (which is rare in Santiago apartments). Both baths have carrera marble countertops, single sinks, full size tubs. The bath for the master bedroom also has an exterior window. BRING YOUR OWN CELLPHONE. NO LANDLINE HERE. The master bedroom is air conditioned, operates with remote control. There is a $50 per week surcharge for heat during the months of June, July and August. All sheets, towels, blankets, bedspreads, and kitchen/cleaning towels are provided. LG washer and dryer (new inn2017) are in the loggia off the kitchen. LG dryer in the loggia. Clear the filter after every load! WiFi with WEP code inside the apartment, plus 2 TVs; 1 TV is an Smart Samsung TV and has a Netflix subscription. All towels and bath mats are provided. Sofa, two side chairs, coffee table, tv cabinet with flat screen tv, Bluetooth-enabled CD player; just connect to your iPod or phone, or listen to our CDs. Drip-style electric coffee pot; electric tea kettle. You'll find coffee, tea, sugar, salt/pepper, pasta, sauce, chips or nuts, and Chilean wine on arrival. All dishes and serving dishes are provided, including water and wine glasses, ice bucket, colander, cocktail shakers, etc. There are knives for cooking and for dining, whisk, potato peeler, etc. The kitchen has an enclosed balcony/patio which lets a lot of light in! There is a full-size LG washer and dryer in the room, plus brooms and cleaning supplies. Full size dining table seats 6. Basic cable tv provided, includes BBC in English. All the Santiago and Chile guidebooks and maps are on our shelves for your use during your stay. We also have novels, mostly in English. We've got dominos and cards. Beatiful view of the mountains and city from our 16th floor balcony with balcony access from living room and master bedroom. The door ways and tubs are not accessible for standard size wheelchairs, and there is a 3" ledge between the living room and the balcony so this unit is not recommended for wheelchair users. 24-hour concierge at desk; groceries can be provided prior to arrival for additional charge (min. $60) with advance notice. $100 US cleaning fee due at departure. No children under 14 years of age. Maximum number of persons is 4 and minimum rental period is 7 nights (one week). The apartment was even more than we expected. The central location encouraged walking everywhere. One can see the Andes from the balcony. The owner has anticipated your every need. Be pleasantly surprised when you rent this condo. Hugo and his brothers were incomparable in their welcome, their availability and their kindness. The apartment is very comfortable, very well equipped and strategically located in the city center close to public transport. He is very safe and a guard is on duty at the entrance. Two grocery stores are within a 5-minute walk. The terrace allows you to enjoy the view of the Andes. We enjoyed our one month stay in Santiago largely because of the comfort of the apartment. We highly recommend this apartment. Very nice apartment in the center of town incredible owner! We just spent a week visiting our daughter who is taking a semester abroud in Santiago and we could not have had a better stay. Hugo, the owner was incredibly helpful before we got there and his brother Patricio took really good care of us while we were there. I rarely give a 5 star rating but I do so for this property without hesitation. We spent a week at this condo in July 2018. The host was very responsive and helpful before, during and after our stay. It is a good downtown location, close to everything, including a metro stop a few blocks away. The condo is well furnished and equipped. We hope to be back some day! This review is more about the character and honour of Mr. Silva. As I was to book into my stay a family emergency had me cancel my visit to Santiago. Mr Silva vas a true gentleman and looked to accommodate me accordingly. I will have full trust in any property Mr. Silva offers in my future travels. Apartment has everything you need and is centrally located. Host left a bottle of wine which was a gracious touch. Convenient to many local universities which was important to us, and just a few blocks to metro stations to get around the city. Santiago is the perfect starting point for visits to Chile's famous wine country, skiing in Portillo and visits to the Lake District in the south. Ask about discounts for stays of longer than 30 days in January, February and March.